Web credibility is a field of research that emerged in the late 1990s, when the web became mainstream. In 2002, BJ Fogg and his team at Stanford University ran a study in which participants were presented two different sites to use. Then, participants were asked to vote for the site they felt was most credible and explain their vote. Their comments were then coded into categories, such as look, structure, and focus. Definition: Prominence-interpretation theory suggests that people determine a site’s credibility by judging prominent attributes of the site that grab their attention. This theory has two key components: prominence and interpretation. Prominence refers to those salient elements of the site that stand out and that the users are likely to notice. Interpretation refers to how people judge those elements. For example, a colorful animated banner ad will be very easily noticed (prominent) and people may judge the site credibility based on it (e.g., by assuming that the site should not be trusted because it has obnoxious ads). The theory goes on to posit that if either prominence or interpretation do not happen, users won’t be able to judge the credibility of the site. In his article detailing prominence-interpretation theory, BJ Fogg defines the factors that influence each of the two components of the theory. We describe them below. Visitors already familiar with the company might scrutinize the site less. The same attribute can stand out on one genre of site or be very typical for a different site. The user’s task will influence what that person pays attention to and is likely to notice. Novice users may read more extensively or seek different information than experts. Expert users may also scrutinize some sites more harshly than others, depending on their expectations. Different people come with different cognitive and physical abilities; these abilities will influence what stands out for them on a page. Users’ personal histories will bias their interpretation of the page elements. For example, an illustration with a party blower in someone’s mouth may be interpreted correctly by an American user and generate a positive connotation, but to someone from a different culture, where party blowers are not as common, it may look like a cigarette and be interpreted negatively. While influencing prominence, skill can also influence interpretation. A lawyer or a security expert may seek privacy policies before entering personal details in a form, while others may be oblivious to potential risks. Users have certain expectations about a site based on standards that they have learned on other sites and on what they think is reasonable. For example, they may be ok with sharing their location with a map application, but they may cringe when a flashlight app asks them to do so. It was based on behavior rather than just opinion of what may play a role in a site’s credibility. People used the sites they were responding about, as opposed to simply saying what they felt was important, without using the site. Fogg’s study also provided empirical evidence that visual prominence of certain elements can influence the credibility of a site, and words alone are not enough to establish credibility. First impressions and visual design do carry power. The study asked people what they thought influenced their feelings about credibility, forcing them to rationalize these emotions. It’s very possible that what people reported did not actually influence their feelings but were the most likely explanations that participants could find for their feelings. Participants had to remember the elements of the site that affected credibility and describe them. It’s possible that other factors that people did not remember affected their assessment of credibility to an even greater extent than the ones they did report. What elements are most prominent on our page? Visual prominence is often established by the visual weight of an object in relation to other objects (i.e. How much contrast does the object have compared to other objects? How large is it compared to other objects?). Does a prominent element add value or increase trust? Is something important not prominent enough? Can we modify our design to make relevant information or images more prominent? Are prominent elements interpreted positively or negatively? Based on what we know about design conventions and standards, how much does the current design meet user expectations? Does our site result in unpleasant surprises? How can we ensure the design choices we make will yield a positive credibility interpretation overall? 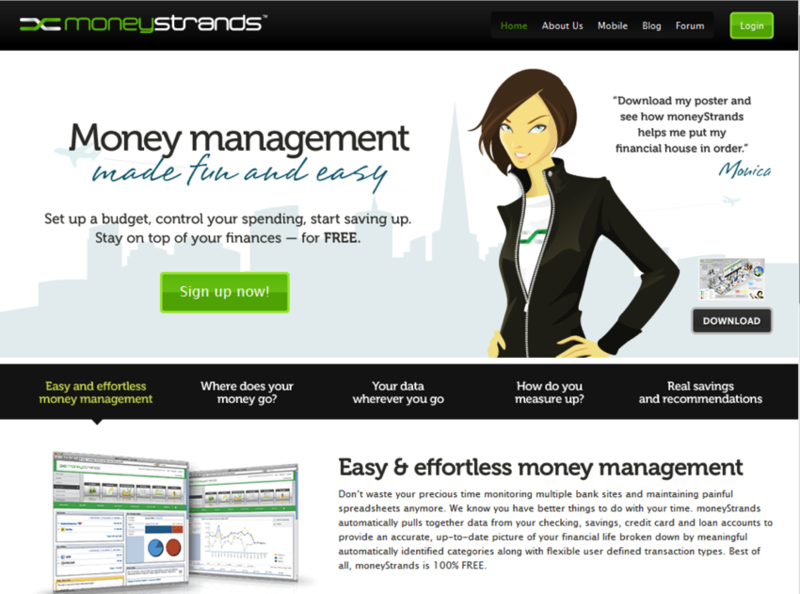 For example, the past version of the site MoneyStrands.com featured a cartoon in the hero space. When we tested this site in a usability study, participants referred to the image as “cutesy” or said that the subject in the image looks “like a spy.” This image is clearly prominent, as it is an element frequently identified by the participants, and in itself is not a “bad” image. It’s well-illustrated and is clearly a professionally looking image. However, in the context of financial services, the aforementioned phrases are not positively interpreted. Thus, by applying the theory, we posited that this highly prominent image with a negative interpretation would result in a negative credibility assessment. Indeed, many users in that study ultimately decided to use a different money-management service. An earlier version of MoneyStrands.com featured a “spy-like” caricature which was negatively perceived by many test participants. The impact of this (or other) illustrations can be considered a case of visual “tone of voice.” Just as when we analyze written tone of voice, a certain tone can be positive for one brand in one industry and negative for a brand in a different industry with a different brand-perception goal. The site has since been redesigned multiple times. In the latest iteration, the hero space features two calls-to-action (CTA) asking for personal information. While those calls-to-action are not inherently bad, the timing and context may cause them to be negatively interpreted. Because many users landing on the homepage will have no prior knowledge of the company, the CTAs are premature and make a negative impression. A recurring theme in many of our studies is that when sites ask for too much, too soon, many users are displeased and lose trust. Thus, a CTA that appears too early (and twice on the same page) can be perceived as needy and erode the credibility of the company (despite the best attempts to salvage it with authoritative logos). 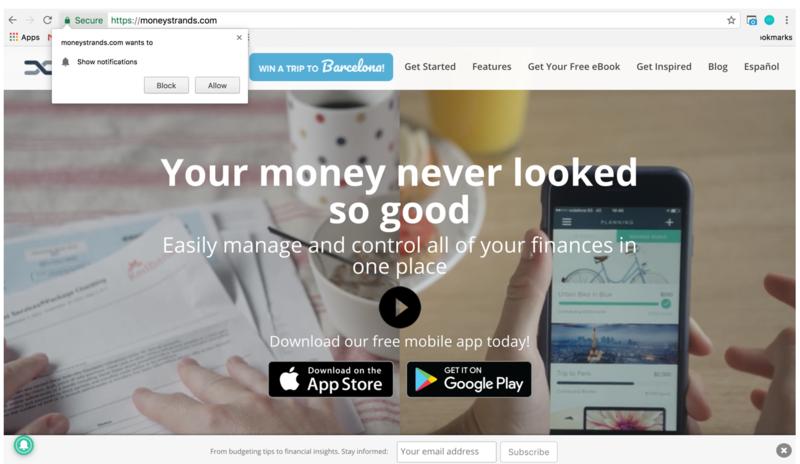 MoneyStrands’ new site design, while it is an improvement from the last, features two CTAs which prematurely ask the user for personal information with minimal detail about what the company does. A positively interpreted element does not need to be a happy person or smiling face. In the case of nonprofit websites, an image which illustrates need can serve to increase credibility (and motivate donations). For example, a study participant visiting SaveTheChildren.org commented that “These children [in the carousel photos] look like they are in greater need… Like they need more urgent care.” However, when the nonprofit sites featured success stories and happy figures, study participants make comments such as “It looks like these kids are healthy…” and were less likely to trust the site and donate. There is a time and place for success stories with nonprofits. However, while the first set of images portrayed negative emotions (sadness, anxiety, desperation), they matched user expectations and anticipated potential donor questions (e.g. “Why should I donate to this charity?”), thus resulting in a positive credibility assessment. 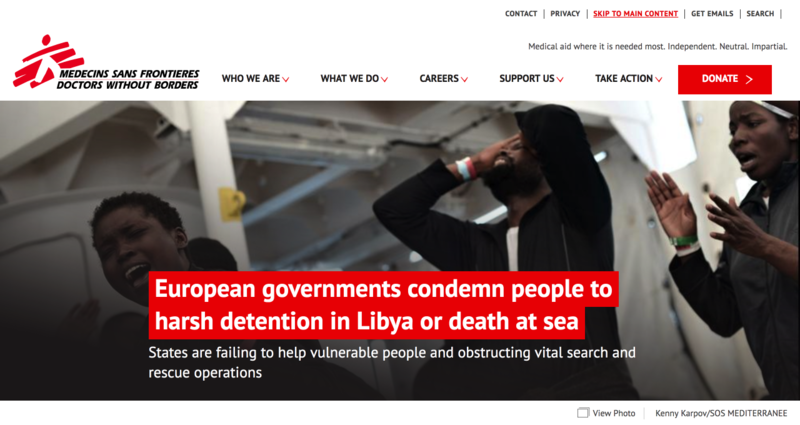 Nonprofit organizations, such as Doctors Without Borders, used images of people in need or visible despair to illustrate relevance and provide a reason for users to learn more, take action, or donate. The interpretation of a site element has less to do with the emotions it evokes and more to do with the expectations it meets (or fails to meet). Teams can test prominence by running a five-second test or other screenshot timeout tests. This timeframe can range from 50 milliseconds to 5 seconds. The shortest amount of time will identify only the most prominent attributes, and as the time window grows, more secondary items will be identified. Once the screen has been shown, researchers should ask the participant follow-up questions such as, “Do you recall anything on that page that stood out to you?” If the participants have a hard time describing what they saw, ask them whether there was a visual or graphic that they can recall, or whether there are any words that came to mind to describe the page itself. This will shed light on what elements are particularly memorable or eye-catching in the first few seconds (or less) on a page. Note that these tests are best run only once, without alerting participants in advance that the screen will disappear. As researchers we would like to mimic reality as much as we can in order to ensure our findings are valid. If participants know that the screen will disappear, they may change their normal behavior — for example, they may attempt to memorize certain elements on the page. If you have multiple screens you would like assess, consider using a between-subject design instead of a within-subject one. The tasks in these studies will greatly influence where participants look, and thus, what they remember. Since budgets, time, and resources are finite, practitioners can then use these findings to prioritize which interface elements are modified in the next design cycle by identifying which interface elements catch users’ attention first. However, it is not enough to know how to grab users’ attention. Interpretation can then be assessed when the five-second test is coupled with usability tests, followed up by open-ended or structured responses, or surveys with numerical ratings. In a user test there is room for closely observing participants’ expectations and for identifying when and why those expectations might not be met. An in-person test can also shed light on issues for which a user may not have a name, but which may still impact an overall credibility assessment. While a survey can be helpful, it should be used as a supplement to other observational research, and not as a data crutch. Creating a credible site and studying users’ impressions is not as elusive as one may think. There may not be a perfect formula for it, but with a careful assessment of elements on our pages we can determine whether our designs convey the right message. Establishing this credibility early on will ensure that our customers trust us. Trust, after all, is the first step to a building a lasting relationship. For more on how to boost credibility, see our course, Persuasive Web Design. Medium is too busy adding features nobody asked for to fix actual design blunders. Push Notifications – Nifty or Nuisance?